Fitted knit t-shirt with a peplum at the natural waist (also includes the option for a longer peplum in the back). ** includes instructions to combine this pattern with Jocole Ladies Pencil Skirt pattern to make a peplum dress, or a pencil dress. You will receive: ONE (1) pdf sewing pattern with 22 pages of step-by-step sewing instructions (25 steps and 50 color photos and illustrations) and 15 pages of patterns to guide you along as you make Ladies Peplum Top. FREE shipping! 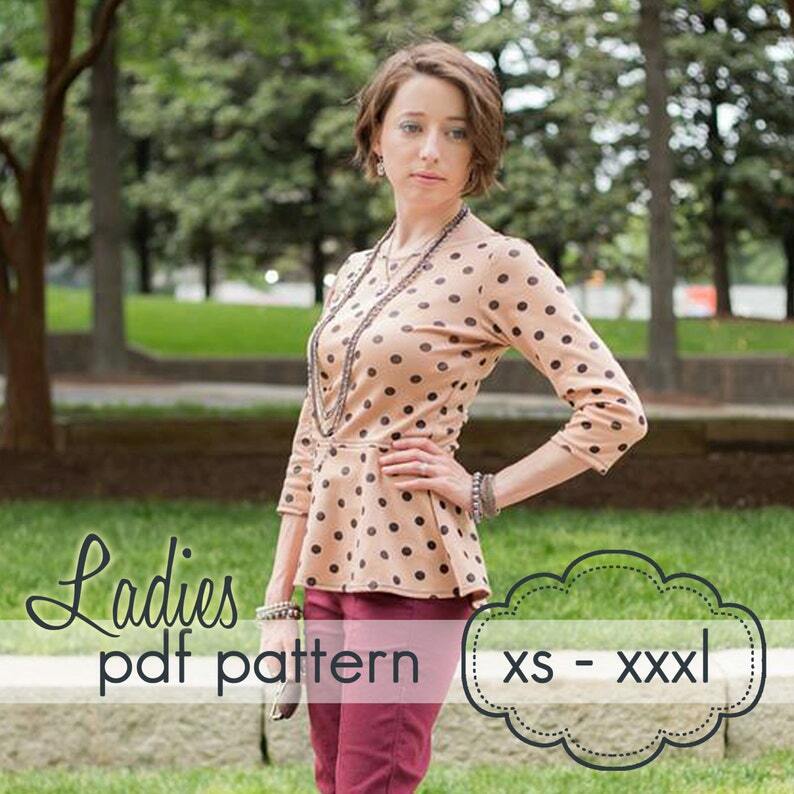 Pdf patterns will be emailed within 24-48 hours after payment is received. It will be sent to the address provided via Etsy. If you have not received your pattern, check your spam or junk folder. Feel free to contact us at any time for help or advice. All patterns are designed and handmade by Jocole. They are hand-drafted and then scanned and digitized into professional patterns. Each size is clearly marked for ease of cutting. Pdf patterns cannot be returned or refunded. Please do not share or give this pattern with others, printed or digitally. Handmade items in LIMITED quantities can be made and sold with this pattern. Design credit must be given to Jocole, jocole.com, or jocole.etsy.com when listing items and on hangtags. Thank you. Have not made this yet but I this is exactly the dress I was looking for. Payment must be made within 5 days or your order will be cancelled. If you are paying by Echeck, orders will NOT ship until your echeck clears (usually about 5 days). not defective. If you are unhappy with your purchase for any other reason, please contact us about the possibility of an exchange or shop credit. *Please Note: Unless an item is defective, we cannot provide return or exchange service for custom orders. Refused & Unclaimed Packages: If you are unavailable at the time the mail carrier attempts delivery, you are responsible for rescheduling the delivery. If you do not claim your package or refuse it and the package is returned to us, you are responsible for reshipping charges. If a refused, unclaimed, or undeliverable package is no longer wanted, a 20% restocking fee will apply and store credit in the amount of the balance less shipping charges and fees will be issued. If you have purchased an item as a gift, and it is not accepted at the gift address and returned to us, we will ship the item, with an explanation, to your address free of charge. Interested in a discount for sewing classes or online Sew-A-Longs?? Just send me a convo and learn about our bulk pricing. Product Variation: The product images in our shop are representative and are not necessarily photographs of the actual product you will receive. Due to the handmade nature of our items, some variations will occur. Due to the differences in computer monitor screens, we cannot guarantee that the color of your item will match the color on your screen. If you are concerned about the color of an item you would like to purchase, please contact us to request a sample. Since many of our items are made with prints, the placement of the pattern will vary in each item. Privacy Notice: Any personal information that you provide to us will not be shared with or sold to third parties. Please contact me for wholesale or "bulk order" pricing.